Tropical fungus gardeners - Leafcutter ants: Atta and Acromyrmex spp. Leafcutters don't leave much behind when defoliating favored plants. Last week we traveled to Australia to visit the magnificent Green Tree Ants and learn how weaving sisters collaborate to keep their arboreal colonies rocking -see Green Tree Ant Sister Act: Oecophylla smaragdina. This week we travel to the rainforest of Belize to visit the most important group of herbivores found in tropical forests in the New World, leafcutter ants. In addition to humans, leafcutter ants are one of only a few species known to cultivate a crop for food. 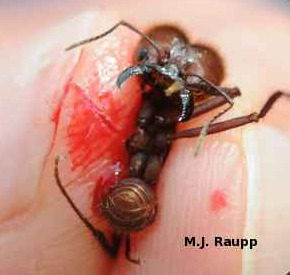 Jaws of leafcutter ant soldiers can open wounds. Night and day, members of the worker caste search for nutritious leaves on trees, vines, and shrubs. When scouts find a suitable food source, they direct other workers to the bounty by releasing trail-marking chemicals called pheromones. With powerful jaws, workers clip small sections of leaves and carry them to the ground where they join a rambunctious procession of nest mates. In this parade, intermediate sized workers busily transport leaf sections while smaller workers sometimes hitchhike on leaves and help defend their sisters from marauding predators and parasitic flies. Nearby, large imposing workers called soldiers also defend their sisters and the colony with powerful jaws. As leafcutters remove foliage from a tree, a parade of ants may extend for distances of more than 200 yards as workers carry leafy cargo back to a subterranean nest. Ventilation shafts cool the underground ant colony and provide for the exchange of gasses. A leafcutter nest is a marvelous structure that may contain several million ants and occupy 600 square meters of forest floor. Sophisticated ventilation systems cool the bustling nest and allow carbon dioxide to escape while drawing in oxygen. Once inside the nest, leaves are delivered to other workers that take leaf sections and clip them into ever smaller fragments. These fragments are carefully inserted into a garden of living fungus maintained by the ants. Leaves serve as a substrate for fungal growth that is harvested as the source of food for the entire ant colony. The fungus garden is meticulously tended by workers. Destructive alien fungi are detected and removed. Secretions produced by the queen and workers facilitate the growth of the cultivated fungus. Fungal strands produce specialized structures called gongylidia. Gongylidia are harvested and fed to the developing larvae and distributed throughout the colony to feed workers and the queen. Due to their agrarian life style, leafcutter ants are also commonly called fungus growing ants. To support their enormous colonies, leafcutters remove vast amounts of vegetation each day. It is estimated that large colonies may remove more than 500 dry weight pounds of vegetation annually. When nests are established near orchards or crops, leafcutters can strip trees and vegetables overnight, causing significant crop loss. Often, irate farmers destroy their colonies. However, leafcutters play a vital role in recycling plant material and enriching and cultivating tropical soils. For millennia in tropical jungles throughout the New World, legions of leafcutters have been the consummate farmers in the rainforest. Even in the dark of night, leafcutters frantically tote clipped leaves back to their subterranean fungus garden. We thank the hearty crew of BSCI 279M: Tropical Biology in Belize for providing the inspiration for this Bug of the Week. The wonderful book "The Ants" by Bert Hölldobler and Edward O. Wilson was used as a reference.